In my opinion, there are a few elements that are necessary to have a fantastic day in a new place. The first includes being able to get out on foot, and take in the sights and sounds to get a feel of the destination. Next, I like to find some of the food that the locals eat. If I can do both of those things with a local guide – all the better. My favorite way to accomplish all of that is to do what is becoming a fast growing trend – taking a food walking tour. I haven’t had a bad experience yet, and the one I took in Prague was no exception. 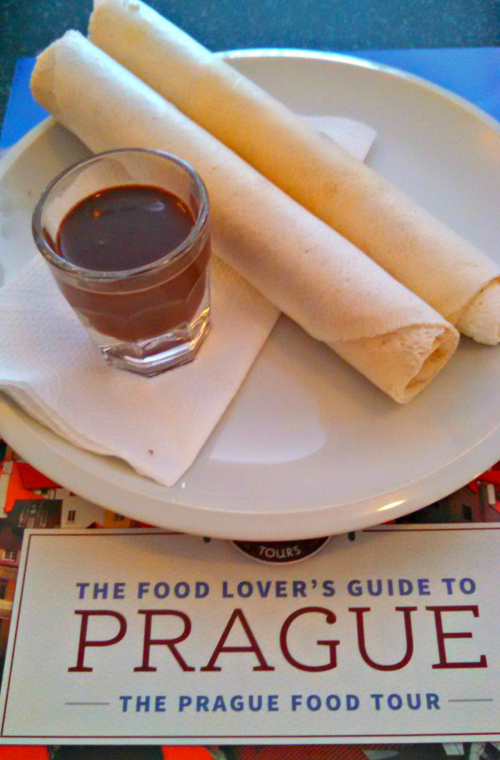 As a matter of fact, taking the Prague food tour was probably one of the highlights of our stay. We started out in a small coffee/chocolate shop. You can just imagine the amazing aroma, and we were hungry. 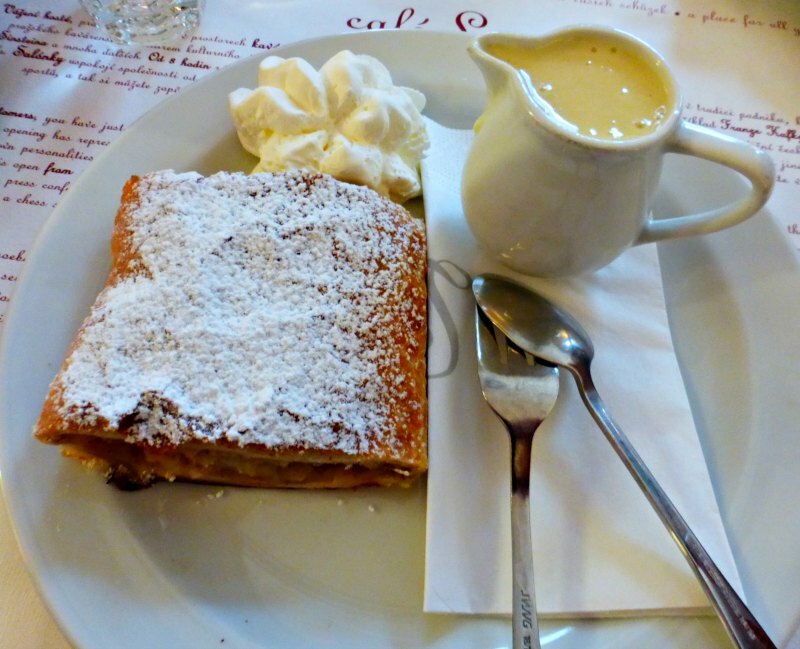 This is an important tip when embarking on a food tour – skip breakfast. Your sacrifice will be rewarded. Our first taste surprised me. We were presented with a small glass cup of warm, thick dark chocolate sauce and 2 rolled pastries filled with whipped cream – Hořicke trubičky rolls. (By the end of the day we had eaten whipped cream several ways – turns out they love the stuff in Prague). The wafer is actually one of the trademarked food products in the Czech Republic due to the technique used to make it. 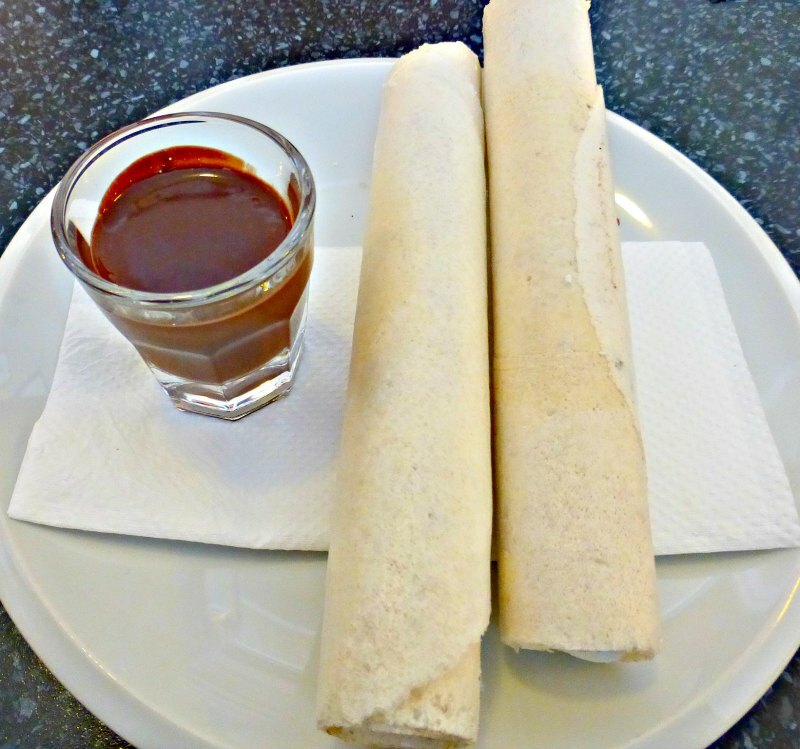 If the thin wafer, which has been in production since 1812, wasn’t made in the town Hořice or its surrounding municipalities it can’t be called a Hořicke trubičky roll (or tube). The taste was unique. The wafer was soft and slightly crunchy and the whole thing together was actually pretty light and not overly sweet. I gobbled one and pushed the second toward my husband Sean, who is typically on the receiving end of half of my food on these tours. This is also part of my strategy of having a good food tour day and not getting overly stuffed in the end. Which works out well for me, and doesn’t always end up working particularly well for Sean. 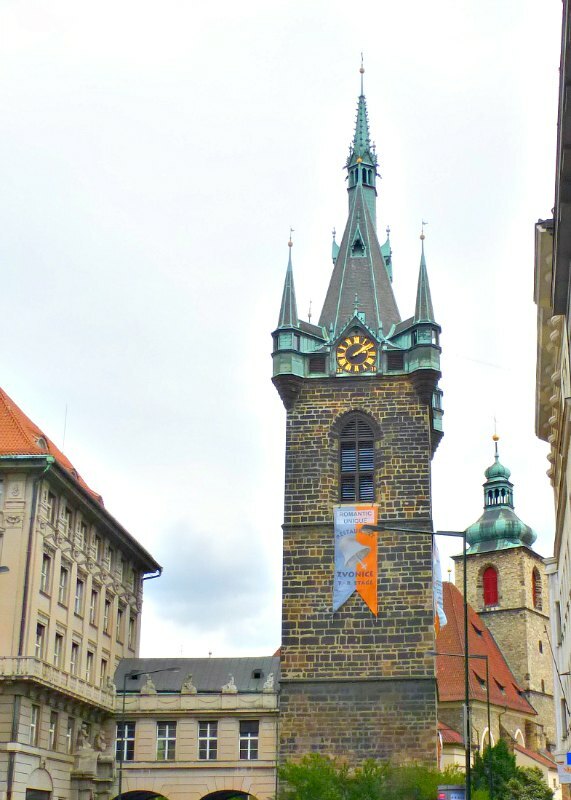 We wandered through Prague’s Old Town and got a feel for the place. The festively painted buildings all around us are a tribute to Prague’s celebration at the ending of Communist rule. The gray, dour effect the Communists had on the architecture and the mood of the people also had a dulling impact on the food. 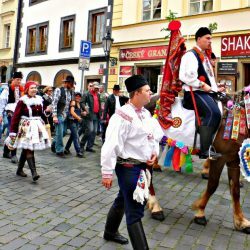 During Communist times, quantity was favored over quality and Czech people were asked to give up their language, religion, and traditions. You can see statues all of the city celebrating the suffering of the hard-working masses. Since regaining their independence the culture and the food has been uplifted – and we were about to taste the results. Our next bites came in the form of very colorful open-faced sandwiches. 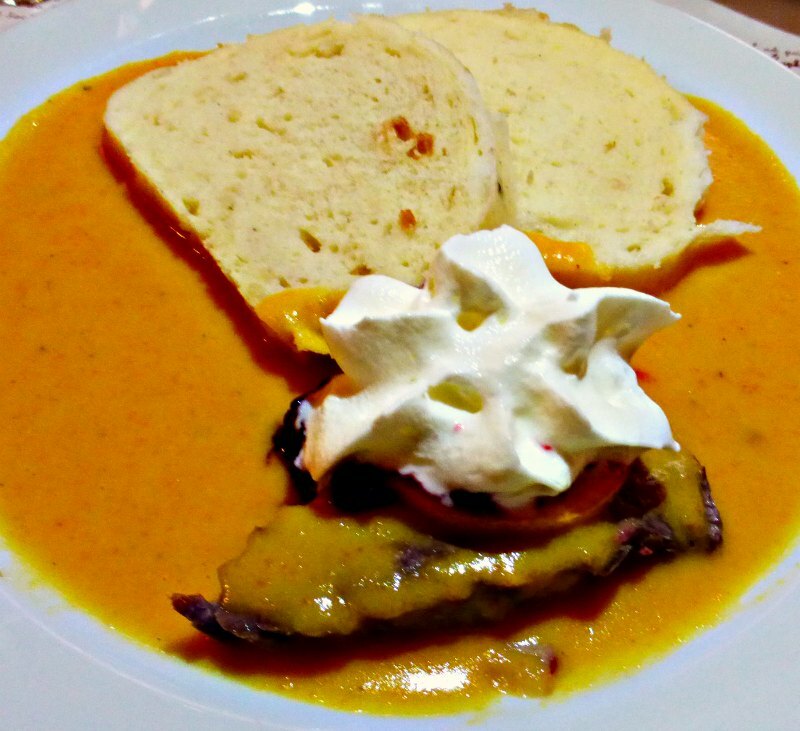 This is very typical Czech food is eaten with a bowl of soup for lunch or as a snack during the day. Office parties or holidays are often celebrated with trays of assorted open-faced sandwiches. The ones we tried had sightly more creative ingredients than is typical, but we didn’t mind. Next we were brought to a specialty meat shop. Here the sausages are prepared behind glass walls so that you can watch the artisans work. We didn’t get to speak to the owner ourselves, but were told that when he described his products he does so with a sparkle in his eye. 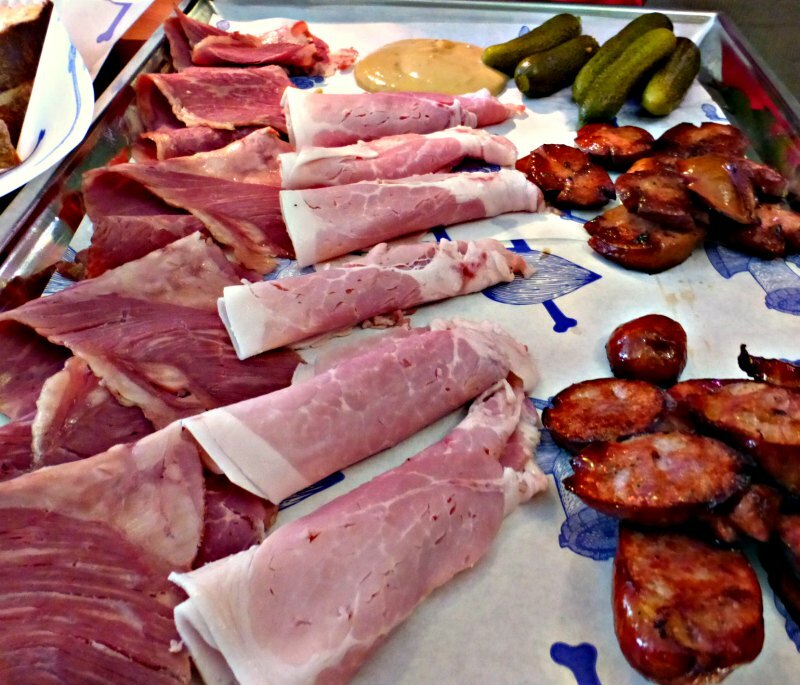 While we didn’t see it, his passion was clear in the sausages and cured meats we tasted. And the mustard that they use here – slightly spicy but like nothing I’ve had before, is a flavor that will always bring me back to Prague. Our next tasting venue was on the 8th floor of a bell tower. 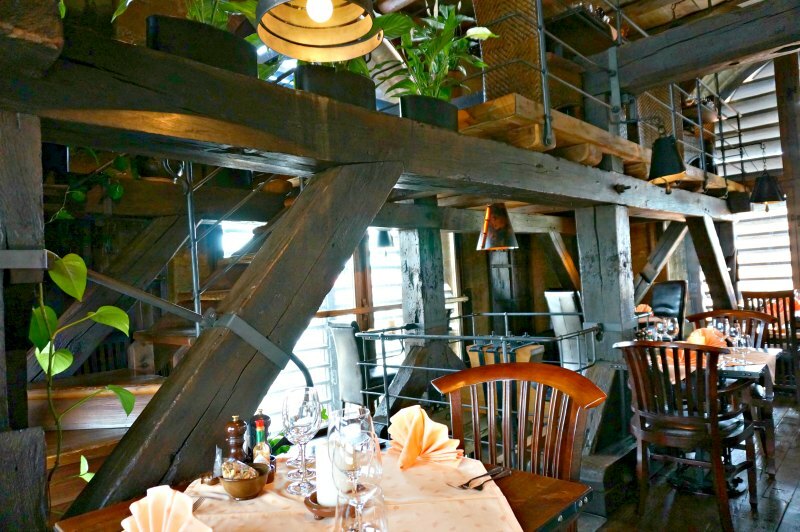 Getting to sample Czech food in such a special place was something I didn’t expect from a food tour. We usually get shuffled into a back room or get fed from a tray. But not this time, this was a place that you’d bring someone for a special dinner. Luckily for us having lunch here is not as common and we actually had the place mostly to ourselves (note taken for future visits). Here we tried the soup. The flavor was really unique and it took us a couple of guesses to figure it out. 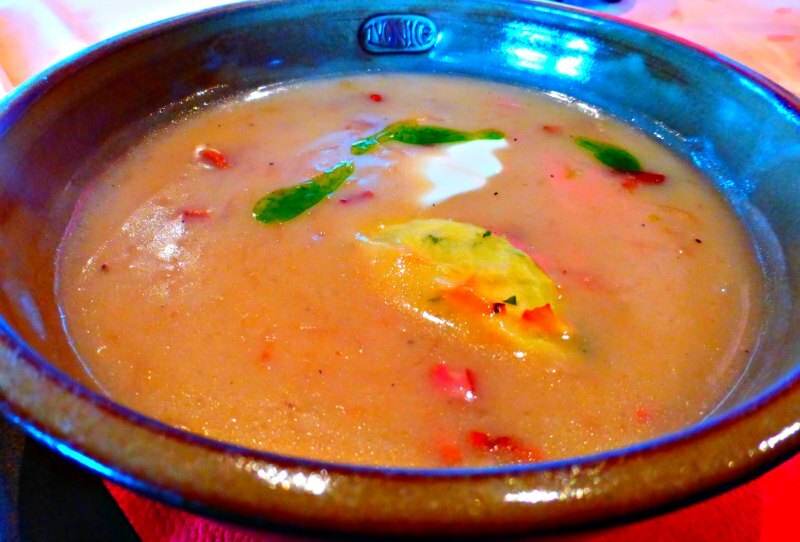 The base of the soup was actually flavored with pureed sauerkraut (pickled cabbage). The Czech people love their picked vegetables. The use of sauerkraut was one way that sailors on long voyages were able to get their vitamin C. Today, you find sauerkraut everywhere, although a milder version that I’ve had (which is a good thing in my opinion). Next we were off to a small restaurant with a cute courtyard – yet another pleasantly surprising venue. The taste here was of a pork pâté and wine made from currants. I’m not a huge pâté fan so I thought Sean may end up with most of this dish. 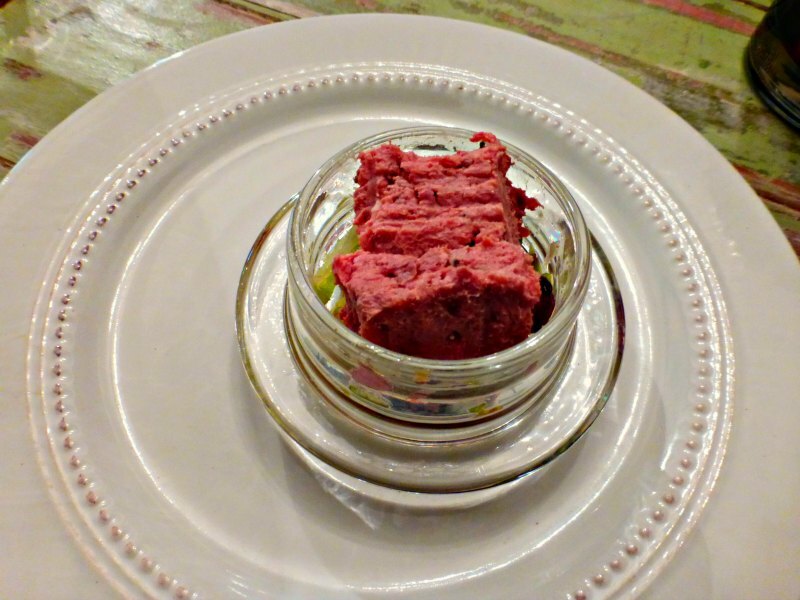 He didn’t – it was creamy with a strong pork flavor that went really well with the sweet wine. Now we were off for the main course. I’m sure even reading this you’re thinking, how could they possibly eat more? I was actually still feeling pretty good, Sean however, seemed to be slowing down. Good thing we had a little walk where we viewed some of the works of controversial local artist David Cerny (the guy who famously painted a Russian tank bright pink and placed it in the center of Prague). His works are scattered throughout the city and are always surrounded by an amused and befuddled crowd. Don’t forget to bookmark or pin this article for later! In this last venue we were treated to white glove service in another restaurant known for hosting special occasions. Here we had one of the most typical dishes in Prague: Braised Beef with Dumplings. The sauce base was a puree of root vegetables and lemon juice topped with cream. The result was a little citrusy and the dumplings (which are boiled rather than baked) were so fluffy that during preparation they need to be cut with a thread to retain their shape. These guys were fluffy but filling, and we were glad we had only a half portion (typically you get 6-7 dumplings – not today). And of course, this was paired with good Czech beer. How could we leave a tasting in Prague without Czech beer, right? Even though we had tasted quite a few things most everyone wiped their plate clean – which tells you all you need to know. We wandered off, full and happy. Some of the flavors really surprised us but everything was fantastic. But what wasn’t a surprise at all was that it was really a perfect day, just like we knew it would be. 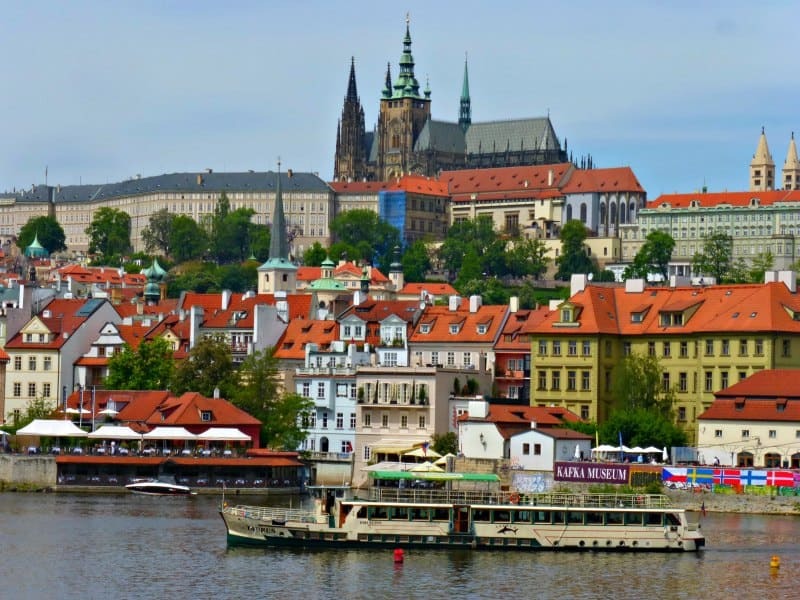 Here are a few additional articles about travel in Prague that may help inspire your journey! 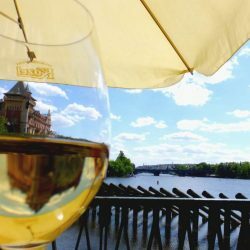 Contact Eating Prague, who supplied us with this tour, if you want the same experience during your visit – and I recommend that you do! As always, our story and our opinions are our own. Sean, we are going to have to get you a pair if stretch pants if Jen keeps pawing half of her food onto your plate. The pastries in the chocolate sause look to die for. 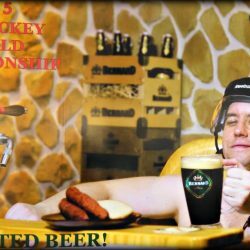 Well, now I don’t need to do any research for our future Prague trip. I can just follow your post 🙂 I want to eat everything you pictured! Will pass this to a friend departing to Prague next week! Yum!! They all sound so good. I don’t believe I’ve had Czech food before but it looks delicious. I totally need to be in the stretchy pants stage, oh yes I remember how good that tour was and it was great we had to walk all over the city for it too! We were just in Russia and had some really great cabbage soup. I wonder if it’s similar to the sauerkraut soup. Was it actually sour? I’d be interested to try that. I really need to go to Prague! This looks amazing. 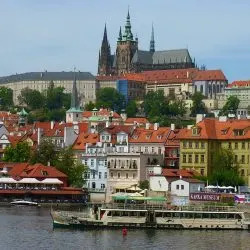 Wow prague sounds like my kind of place – I absolutely love chocolate and whipped cream! Must visit as soon as possible! yum yum yum! The food in Prague is soooooo good, I think I now have an addiction to dumplings! I have to say the pork pate sounds a little blerh to me – but if you say it’s good then I’ll have to try it next time we’re in Prague. the food looks delicious! having two little boys these types of tours are not on our radar but once they will sit still for a meal i can’t wait to take in some good local food on our travels! Yes to food tours! I’ve done a few and they’re always a great introduction to a city/country…This all looks super yummy!